Before kids, I was prolific at a lot of things: I read a lot, travelled, experimented with different instruments, took as many classes as I could, tried new hobbies and interests, and made myself busy in my community of church and school and work. I don’t need to give you the punchline, since you may know it already. I had three kids and had to pare my life down to the more essential things. My job as a nurse, the laundry, homeschooling, basic church attendance, and your garden variety family stuff all took priority over all the learning and growth that I spent the first 24 years of my life voraciously nurturing. Fast forward through ten years of pregnancy brain loss and sleepless baby brain loss and toddler raising brain loss, and I’m coming out of a bit of a fog and able to concentrate again on things that I used to enjoy. I’m consuming more books, getting a little more exercise, and even finally got a career credential/certification done that I have had on my to-do list for almost 10 years now. I say this to say: HANG IN THERE! To be honest, what really brought this to mind for me is the way I’ve seen my moods fluctuate with the seasons. Every year, around this time, my energy levels are low, my discouragement about my parenting and goals is very high, and I am always itching to make a change, usually at the expense of my haircut, my job, and my mind’s ideas of what I need to make me “happy.” Last year at this time, I decided instead of letting myself get mired in ‘What Ifs’ or grandiose plans for unnecessary change, I would just try to pick one thing to challenge myself and stretch out my brain so I wasn’t only thinking about the laundry or my kids for a few minutes a day. I took a class for the nursing credential I wanted to test for, picked up my dumbbells for a few minutes a day, and tried to read one book a week. Just one. Here’s another punchline: I only did one of those things with any regularity and with a big lasting habit to follow it. I got my credentials, but I didn’t read a single book all spring or summer and I sure didn’t exercise at all like I should have. BUT…my brain felt so good doing something new. I felt victorious for trying some new-again things, and I took away a few good habits even though I didn’t make any huge life changers happen. Those small new things took root and gave me encouragement that I could–with a little extra concentration–take back some of those old enjoyments and start introducing them back into my life. It also has taken some of the slump out of the slumpy season for me; instead of the same old thing, I know I can pick up something small that makes me feel like my brain is growing rather than shrinking, my experience growing beyond the walls of parenting so that my kids can reap the benefits of a mom who isn’t stuck in a rut. Also, self-care is so, so much more than manicures and shopping therapy; don’t sell yourself short, moms! Sometimes my natural inclination as someone busy taking care of others is to use my free minutes to relax, when what I really could use is something that gives me an energy outlet, either physically or mentally. Grabbing just a sweatshirt and gloves and working up a sweat by shoveling our long driveway. Raking the yard instead of leaf blowing. Running around with my kids rather than sitting it out. Taking up a challenging skill or picking up a forgotten one that takes some time to learn, slowly. As someone who is easily depressed by little shifts and changes in life, I encourage others who might feel like they’ve got the same disposition to keep an eye out for those triggers and seasons of the year that are most likely to lay you low and head them up at the pass by starting a new something that challenges you and gives you a small, attainable, meaningful accomplishment to work towards. 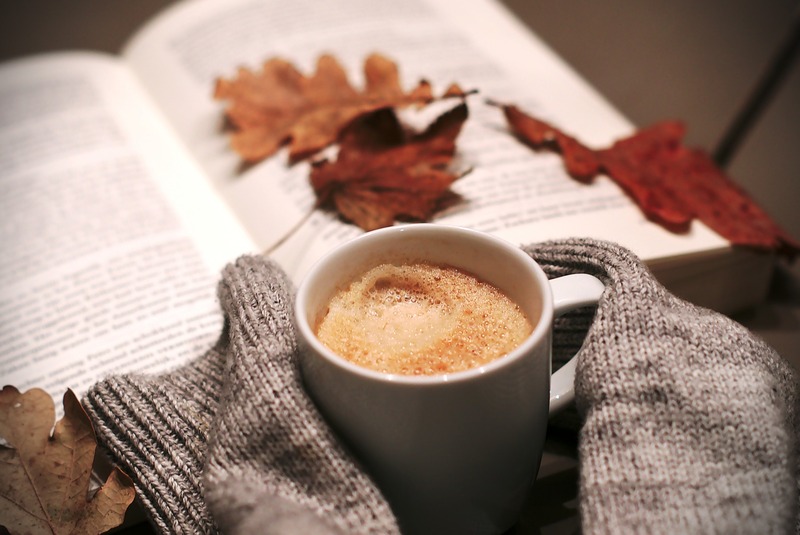 For me this fall, it is just to take an hour in the evening to try to concentrate and read a book. I’ve been reading a familiar one and alternating with a new book that is more challenging. The most surprising thing of all to me? Amazingly, most nights I find myself putting off other things just to be able to read an extra few minutes.